Tuesday night sees a Yorkshire Derby at Bramall Lane. One of the biggest matches of the season, as last season's play off finalists (and pre-season favourites for promotion) Huddersfield Town take on the Blades. With the Blades top of the league and the Terriers in 5th it wouldn't be out of the ordinary to expect a crowd of around 25,000. The Town support numbered near 5,000 across the city at Hillsborough last year, but it is unlikely to be repeated in S2. An internet forum campaign for away fans to boycott the match, because of ticket prices charged by the Blades, has gathered momentum. Originating on Huddersfield's fan website Down at the Mac, it has now been picked up by fans of other clubs and also the Football Supporters' Federation. The match is one of four this season for which the Blades are charging Category A prices. That means an away seat in either the Bramall Lane Lower or Upper tier will cost Town fans £28.50, which they rightly claim is an extremely high price for a League One match. As I mentioned on A United View a couple of weeks ago, I attended an entertaining Premier League game between Bolton Wanderers and Manchester City at the Reebok Stadium for fifty pence less. I also attended a Europa League game between Anderlecht and Bursaspor in the best seats for €24. To be fair, the price is high and the Blades have already lost revenue this season as a result of pricing policies, but not necessarily from away support. A True Blades are at the Lane promotion launched last spring was used to push season ticket sales at the expense of match-day customers. Season ticket holders, quite rightly, felt anger at the number of one off match promotions the Blades had offered last season, in a desperate attempt to fill the ground and back the team to safety. A friend of mine came close to renewing and one didn't on the basis that, “the club want your money earlier and earlier, yet with a couple of matches missed through work commitments might as well have turned up and paid on the day.” They weren't the only ones to feel that way. 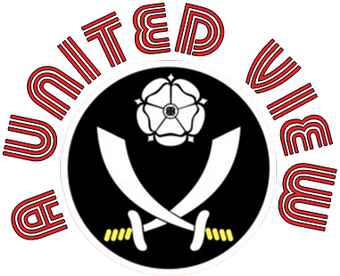 True Blades are at the Lane aimed to remove the frustrations of season ticket holders by defining the season ticket prices (give or take the same as last season) and providing a guaranteed saving against heavily inflated match-day prices for football in a division below. In my eyes, my season ticket still offers great value, it works out at around £13 per game and relegation was never going to stop me attending. However with increases for new season ticket holders, flat renewal prices and higher match day prices alongside relegation and an unpopular managerial appointment, it has inevitably led to season ticket sales falling and walk-up supporters being deterred by the prices. Interestingly enough, the brains trust behind the ticketing for this season and the man who put his name to the letters telling them that only True Blades are at the Lane (the rest of you..... aren’t), Steve Lewis, recently left his role of Head of Commercial after just eight months. So if I have an issue with the pricing at Bramall Lane, why have I an issue with the Huddersfield protest? Because it pointing the finger at United, they are ignoring their own club’s pricing policy and the relative prices elsewhere. They are the equivalent of the Three Wise Monkeys where The Terriers are concerned, Hear No Evil, See No Evil, Speak No Evil. It is interesting that, throughout the campaign, Huddersfield don't appear to be making any public statement on the matter. Maybe this is because they appear to offer the same categorisation of games and not dissimilar pricing themselves. At the Galpharm Stadium, the Category A prices range from £23 to £28. The Family Stand is opposite the away stand and charges £23 in the lower tier and £25 for the upper tier. Not a significant price differential to what United are charging. Part of the issue appears to be that Huddersfield fans saw that Bury fans paid £14 for the same seats a couple of weeks ago, but that was one of 4 Category C games United have a season. Funnily enough, Huddersfield have Category C games, they charge a minimum of £19 for them and you can bet your bottom dollar when the Blades visit we will not be a Category C match, nor a Category B one. The big issue is pricing in general across the game and establishing a tipping point, beyond which it is determined that a price is too high for that division or for the facilities and quality of experience on offer. For instance, although Huddersfield fans complain about paying a couple of pounds more than the equivalent seats in the opposite end, it is worth noting that the Bramall Lane Stand is opposite our Kop, which doesn't have indoor concourses, covered food outlets and under cover toilet facilities. It also has bloody great pillars in the way of our view. Added to which the upper tier of the away end has one of the best views in the ground. Can comparisons of equivalent home ends be a valid comparison? I think United were basing the price on what home fans are charged in the corner adjacent to the away end and also what they are charged for the upper tier of the Bramall Lane stand when it is not given over to away support. In principle that basis is not unreasonable, although the base price may be to start with. How does the price, view facilities at Bramall Lane compare with what Terriers' fans got for £20 at Rochdale, £25 at Hartlepool, £23 at Oldham and what they will get for upcoming games at Brentford (£21 seats, £20 to stand!) and MK Dons (£25)? It is also worth noting that at most of these grounds, the under 16 price is broadly similar to the £14 charged by United as well. One other factor to throw into the mix is the cost of travel to these grounds. Will those fans be happy spending much more money going to watch the Terriers at Hartlepool, Brentford and MK? To my mind, away support is about more than a match ticket alone. I used to base my trip on what I can afford, if the coach, ticket food etc was out of my budget I wouldn't go. I can't help feeling that the complainants here were not regular away match goers and were just looking for an excuse not to go. The excuse, in this case a seat costing a whole £3.50 more than one at the Galpharm, was convenient enough to make them do it. I am not denying there is a problem and that fans across the leagues need to find a voice to rise up and defend themselves from exploitation. If they feel a protest involving not supporting their team is the way to do it so be it. But throwing brickbats at United seems a rather futile way of dealing with a bigger and more widespread problem. Will United change their pricing policy for away fans? Probably not. Will other clubs sit up and take notice? Probably not. Assessing the situation now suggests that the campaign can only be seen as a partial success. Over a thousand fans are expected at Bramall Lane, far more than the organisers of the boycott would have hoped for. Maybe the pull of the game was enough to withstand the price increases, maybe these fans realised that there are better ways to fight this than a flawed and mis-informed campaign based on one match. We are already seeing the prices of tickets reach exorbitant levels in the Premier League and that price inflation is now affecting other divisions, but aside from price reductions at QPR (where fan power had to be allied with a change of ownership for it to happen) is there anything fans can do apart from stay away? If they do stay away does it really matter to the clubs? It would be great for the football league to get involved and agree a price limit for away fans in each division, but while ever it is an unregulated free market clubs can charge what they want and bare the consequences either way. In fact, you could argue that football clubs are being placed in a position now where the extra costs of policing and stewarding a decent sized away support might actually deter them from offering attractive ticket prices. This is an issue affecting supporters of a majority of clubs and it needs a unified approach from organisations such as the FSF to confront the authorities and say enough is enough. I am not sure that arbitrarily picking on one club, especially when they are not acting in a significantly different way from both the norm and the club of the complainants, is the way to go about it. Leicester fans contemplated a similar boycott against Barnsley this weekend gone: a rise from £23 last season to £30 this season was the problem there. I believe we would be charging them £28 or so when they travel to the King Power but the change of category was frustrating. I understand raising prices for derby games but if it is raised because a team is 'high-profile' (or 'big-spending' it seems in Leicester's case) it just means that fans of those teams become out of pocket as they travel to category A away games all season. That said, if you support a team then you can prioritise other things to afford inflating prices depending on how important that team is to you. Boycotting a match and not going will not help support that team, whatsoever. The categorisation system needs to go. At the end of the day the people that are attending the games whether they are Huddersfield Town fans or Bury Fans are still sitting in the same seats, using the same facilities, eating the same food, drinking the same drink, using the same toilet, watching the same sport so why should the price be doubled? People can't afford the ticket price plus travel and food on top of the ticket price! There should be a standard price for every team for every ground in L1. Interesting stuff. You're right to say that it isn't a problem specific to Bramall Lane (see this post about non-league football, for a comparison: http://wherestheteahut.blogspot.com/2011/09/non-league-price-hikes.html). Football will remain scandalously overpriced in this country so long as clubs at all levels continue to live beyond their means. As things stand, any drop in revenue is immediately passed on to fans. Only legislation or a catastrophic fall in attendances is going to make any difference to that. Price of tickets is scandalous and I don't blame Huddersfield fans for arranging a boycott. As far as prices at Bramall Lane are concerned arguably there's only one category A game & that's against Wednesday. All the rest are 3rd division fixtures & for me shouldn't attract prices anything over 15 notes. Personally I've made a conscious decision to avoid professional football if it's more than 15 quid to get in. I won't pay over that to watch a 'product' (as the football executives like to say) that simply doesn't warrant such a price tag. They want to treat me like a consumer then I'll ferkin' act like one. My disaffection (Ian please forgive me for linking my blog) can be traced back to this ..